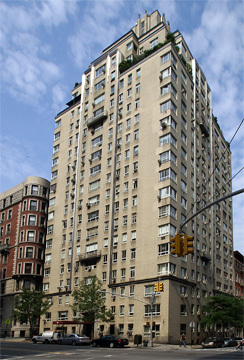 The 20-story building is one of the Upper West Side's major Art Deco towers. Erected in 1936, it has stainless steel protruding elements from the facade that are simple and sinuous, but bold. It was designed by George F. Pelham. The building, which was converted to a cooperative in 1985 and has 102 apartments, has many corner windows and terraces. The canopied entrance leads to a step-down lobby. The building has a doorman and consistent fenestration and permits protruding air-conditioners. 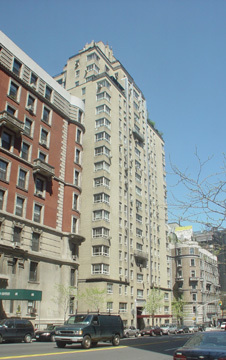 In his March 12, 2006 "Streetscapes" column in The New York Times Christopher Gray noted that "Not many developers had the courage to build tall in the middle of the Depression, but Nathaniel Wallenstein put up two at the same time, one on 88th Street and one at 411 West End Avenue, at 80th Street," adding that "Together they play a modernistic, long-range duet within a matrix of 1910's-1920's neighborhoods." 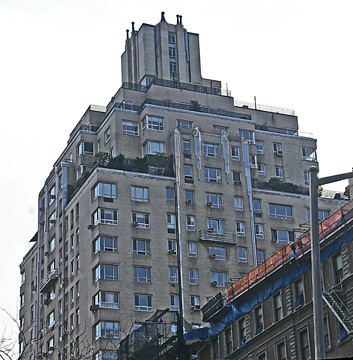 "The 411 West End building opened in 1936," the article continued, "the same year that Wallenstein completed 19 East 88th Street, in a completely different vocabulary and designed by William Dowling. The Times said that both 411 West End and 19 East 88th were 'hailed by builders and realty interests as an omen of recovery.' The Wallenstein project at 88th and Madison had interiors similar to those at 411 West End Avenue - advertisements for both boasted air-conditioner electrical outlets - but it also had a noticeably different take on Art Deco. Unlike 411 West End, which is purely vertical, the 88th Street building is an unresolved 16-story battle. Horizontal forms of dark- and light-brick bands tussle with the centrally placed vertical bays of windows. But there is more to look at here than 411's single trick in stainless steel. At 19 East 88th Street, the horizontal terrace grilles on the topmost floors race around the balconies like zipper lights, their curved corners suggesting streamlined ocean liner design. There are several patches of patterned brick, like the huge sawtooth-pattern panels near the top. And, in the rear, there are two flying buttresses, which are not used for the sake of the structure - as in supporting the sidewalls of a medieval cathedral - but to enclose vent or plumbing chases as they go up the outside wall and jump in midair across two terraced setbacks. 'In 1935, he began these two much-more-ambitious projects on opposite sides of Central Park. At 80th and West End, he had the veteran architect George F. Pelham design a 20-story building, its cream-colored facade relieved by casement windows, some wrapping around the corners because of newly developed cantilever construction methods. But what makes pedestrians pause and look up are the flowing stainless steel bands running across the top and dripping down the front like a metallic waterfall. Developers had new ideas about interiors, too, and ads for 411 West End Avenue specifically mentioned sunken living rooms, colored tile in the bathrooms, Venetian blinds, glass-enclosed tubs - and 'stall showers in every bathroom,' according to an advertisement in The New York Times in April 1936. A five-room apartment had a circular entrance gallery, and there were duplex apartments with terraces on the setbacks of the building." "Over the years," the article said, "these two siblings, built as rental apartments, have aged differently. The facade of the Pelham-designed apartment house at 411 West End Avenue looks fairly clean, perhaps because of the scouring winds along Riverside Drive. All of its metal casement windows have been replaced by modern ones meant to evoke, although not match, the originals. This effort is quite presentable, but the aluminum of modern replacements lacks the spiky sharpness of steel. On the other hand, the co-op specified a creamy vanilla color, sympathetic to the softly colored brickwork." 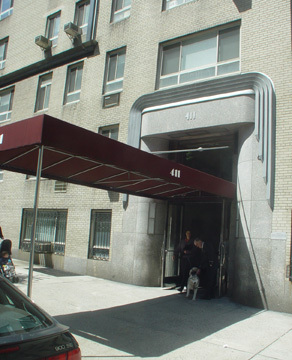 "The next project on which Dowling and Wallenstein collaborated was another apartment house, at 25 West 54th Street, which was completed in 1939. Like its precursors, it uses cream-colored brick, but there are no stainless steel strips, no sawtooth brick, no flying buttresses - it is just a plain-vanilla box," the article maintained. This neighborhood has excellent shopping as well as many interesting restaurants and a local subway station is nearby at 79th Street and Broadway. Riverside Park is one block away.